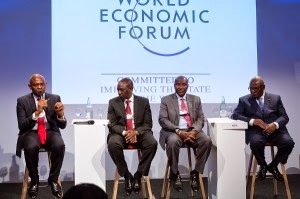 Speaking at a high profile panel on energy at the 2015 annual meeting for the World Economic Forum in Davos, Switzerland, Nigerian billionaire and philanthropist Tony Elumelu emphasized the key priority for 2015 for Africa: launching the African Energy Leaders Group (AELG), a multi-stakeholder advocacy group that aims to address Africa’s power deficiency—the continent has approximately 620 million people without electricity. Investors know the risks are huge and the capital requirements are equally huge. Investments have to first survey the environment beyond economics; policy, stability, enforceability of rules, the nature of the regulatory framework. If the right policies are in place, investors and financiers will invest. AELG will bring the continent’s leaders together in an effort to build public-private partnerships, leverage political support and mobilize funds for sustainable energy and development. Created by a working group of African leaders including billionaires Tony Elumelu, Aliko Dangote; Donald Kaberuka, President of the African Development Bank; Prime Minister Daniel Duncan of Ivory Coast; and President John Mahama of Ghana, AELG’s mission takes the form of three pillars—driving universal access, driving efficiency and driving renewables.